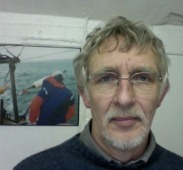 Nick Howell has spent most of his working life as a fish merchant and processor in Newlyn. Now semi-retired, he still owns ‘The Pilchard Works’, a registered brand that he created in the 1980s when he bought Cornwall’s last salt pilchard factory. The old factory was converted into apartments in 2005 and the company now specialises in producing tins of Cornish Pilchard fillets for Waitrose and major UK delicatessens. Born in Hong Kong in 1951, Nick Howell moved with his family to the UK in 1960. After a public school education he had a range of careers, including filling supermarket shelves, working in the hotel trade, making on-site building sculptures with William Mitchell Design, and working in the newspaper industry with The Scotsman and The Newcastle Journal. Dissatisfied with commuting to London, aged 24 he decided to get as far away as possible and moved to West Cornwall. Starting as a fish merchant in 1975, within ten years Nick Howell’s company had the most modern factory in Newlyn and was the leading Cornish fish exporter to Spain and Belgium. The Pilchard Works was bought in 1981 and the fresh fish business was sold at the top of the eighties ‘high’ in 1990. Nick Howell is credited with initiating the recent revival of the pilchard industry by re-branding the fish and supplying them as ‘Cornish Sardines’ to Marks and Spencer’s in 1998. This has enabled other processors and vessels to increase landings from 7 tonnes per year in 1998 to 2,400 today. Abiding interests include painting, restoring vintage and veteran cars, family and self-sustainability.